[Infographic] What is a Litigation Consultant and What do They Do? Note: see final version of infographic and related article by clicking here. What is a litigation consultant? Since the legal landscape has changed so much in recent years, the definition of this term has changed considerably from a practical perspective. Briefly, a litigation consultant is anyone brought into a case, other than an attorney, paralegal or similar employee, who helps a litigator improve his/her chances of winning a case by elevating the attorney’s performance, saving time, and increase the persuasiveness of the litigator and trial team. Last week, we wrote that litigation consulting is no longer a novel idea and has indeed become commonplace. Although we tried to define the role of a litigation consultant, we think it needs further clarification and definition. 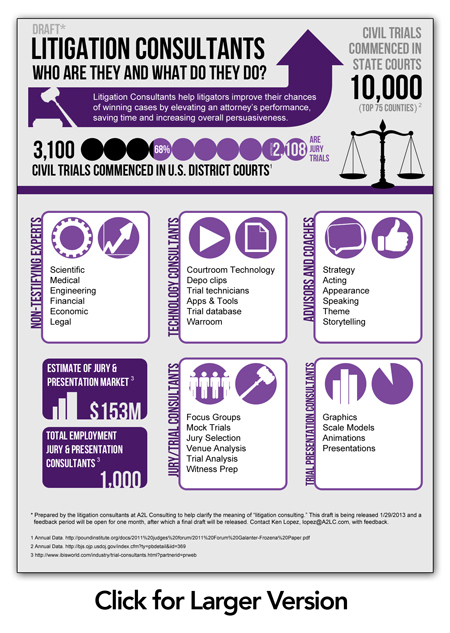 So we have prepared this draft infographic (see also, what is an infographic), providing an overview of the litigation consulting industry. This is the best way we know to help generate discussion and encourage feedback so as to make the definition more useful. Soon we will create a more detailed infographic that explains the precise nature of litigation consulting. We are putting this document out as a draft now in order to obtain input from those who are already in the litigation consulting industry and from those who hire litigation consultants, with the purpose of further refining the definition of litigation consulting. We hope that this exercise will produce a workable definition that will increase the general understanding of this fast-growing field. In a month or so, we'll release a final draft and update this document over time. What we know now is that as advisers and coaches, litigation consultants help lawyers improve their skills of acting, appearance, speaking, and strategy, often focusing on theme or story development. As jury experts, they create focus groups and mock trials and advise attorneys on jury selection, venue analysis, trial analysis, applications, tools, and witness preparation. In the realm of trial presentation, they provide graphics, animation and scale models, and coordinate all manner of presentation services. As experts in trial technology, they help in both the war room and the courtroom and provide deposition clips and trial databases as needed. Some litigation consultants are non-testifying experts on scientific, medical, engineering, financial, economic, and legal topics. They serve as consultants to a trial team throughout trial. We hope to add to and to refine this definition with your help! Please help us by leaving a comment below. You may, but do not have to, enter your full name. Your email will be kept completely private.